As technology advances more and more customers want to collect the weighing data but in the past in steel applications etc. where weighing has generally been carried out using crane weighers this could not be done. This is now possible by means or our Net Scale System which allows all of your crane weighers to be linked to your ERP system’s, thus the weighed data can be displayed/controlled by peripheral devices such as tablets etc. When using weights from any weighing system to carry out any transaction where a payment takes place you must comply to Weights and Measures Legislation, using our Net Scale system makes this simply and the complete unit meets all necessary approvals needed. 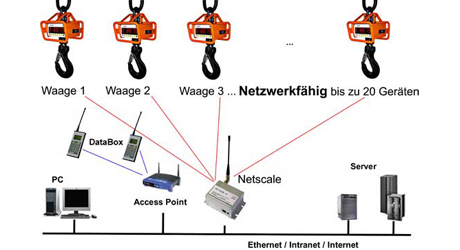 We can collect data in this way using any of our EHP crane scales new or existing by installing the radio card within the crane weigher itself and then setting up the Net Scale receiver.